South Africa 1st innings 309 and second 3-145 (Hashim Amla 57*, Jacques Kallis 31, Steven Finn 1-28) lead England 1st innings 315 (Jonny Bairstow 95, Ian Bell 58, Morne Morkel 4-80) by 139 runs. Jonny Bairstow did not disappoint the selectors in the final Test and smashed his career best 95 runs as England earned a nominal 1st innings lead of 6 runs. 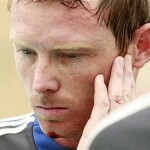 Bairstow was inducted in the side after Kevin Pietersen was omitted from playing eleven in the crucial third Test. South Africa scored 309 runs in the first innings, England responded with 315 and the visitors managed 145 for the loss of 3 wickets in their second innings and gained an overall lead of 139 runs. The third day’s play of the final Test of the series came to an end on August 18, 2012, at Lord’s, London. Earlier, England started the day at 5-208 in 72 overs and Jonny Bairstow along with Matt Prior were unbeaten on 72 and 22 runs respectively. The proceedings were slow in the initial three overs and Bairstow dispatched the first four of the day in the 76th over. The visitors got the first breakthrough when Prior was caught in the second slip by Jacques Kallis off Vernon Philander for 27 runs as the total reached 221. Stuart Broad joined in next with Bairstow and the boundaries started flowing frequently. They added 31 runs for the seventh wicket as the first was gone for 16 as Graeme Swann walked in the centre and opened up with a couple of fours in the 90th over. Jonny Bairstow was unlucky to miss his maiden ton by just five runs when he was clean bowled by Morne Morkel. Swann played a fighting knock of unbeaten 37 runs as the entire team was bowled out for 315 runs in 107.3 overs and England took a psychological lead of six runs in the first innings. Morne Morkel and Dale Steyn were the major destructors with four wickets each whereas Vernon Philander held two. The Proteas opened their second innings with Alviro Petersen and the skipper, Graeme Smith. The latter was the most aggressive of the two and sent the ball rolling out of the fence thrice in the initial six overs. Smith was cautious with his batting, scored 8 runs in 31 balls and tasted his first four in the 13th over. The score was taken to 33 without any loss after consuming 16 overs at the tea interval and an overall lead of 27 runs was registered by the tourists. Smith tried to speed up the run rate and gathered two boundaries in quick succession but was declared leg before wicket off Graeme Swann for 23 runs. The first wicket fell at 46 and four runs later Petersen followed his skipper in an identical fashion on the bowling of Stuart Broad for 24. Hashim Amla and Jacques Kallis got together at the crease, tried to consolidate the innings for the visitors and kept the score board moving. 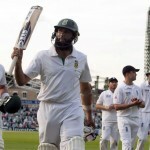 Kallis secured two boundaries in the 31st over as Amla kept on creeping at the other end. The first hundred of the innings was posted on board in the 35th over and the third wicket association resulted in useful 81 runs. 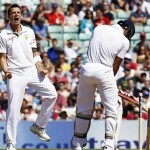 Jacques Kallis became the next victim after Steven Finn claimed his wicket for 31 runs. Dale Steyn was sent in next as a night watchman whereas Hashim Amla achieved his 24th Test fifty in style with two fours in the last over of the day. The visitors reached 145 runs in exactly 50 overs with seven wickets in hand, Amla was still at the crease with 57 and Steyn had yet to open his account. Stuart Broad, Graeme Swann and Steven Finn were the only successful bowlers for the hosts with one wicket each. South Africa is 139 runs ahead in the second innings and there is still a lot of batting to come. They will try to lift their lead to 350-375 runs whereas England will anticipate some quick wickets in the first session of the play to get a command over the match. Adios to the ‘Very Very Special’ Laxman!